STRASBOURG, FRANCE (REUTERS) – A manhunt was under way in north-eastern France early on Wednesday (Dec 12) for a gunman who killed three people and wounded a dozen others at a Christmas market in the French city of Strasbourg on Tuesday evening. Police identified the suspect as Strasbourg-born Cherif Chekatt, 29, who was known to the intelligence services as on the “S” watch list of suspected extremists. Nunez said it was believed that the attacker had been injured by security forces but that could not be confirmed. His whereabouts now were unknown, and commandos and helicopters were involved in the manhunt. 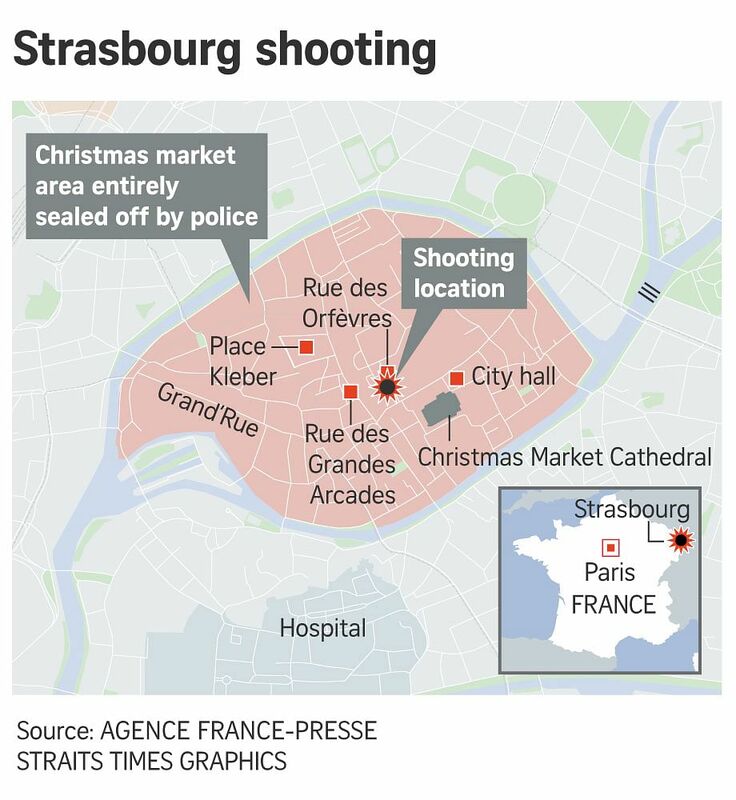 A Reuters witness saw police briefly seal of an area near Strasbourg cathedral, but the operation ended quickly. Nunez said the suspect had a police record and had been in jail several times, most recently at the end of 2015. He added the suspect had been monitored for religious radicalisation. “He fought twice with our security forces,” Mr Castaner told a news conference held in the city. The attack also left 12 people injured, he said. The Paris prosecutor said the motive for the attack was not known. No one immediately claimed responsibility, but the US-based Site intelligence group, which monitors jihadist websites, said Islamic State in Iraq and Syria (ISIS) supporters were celebrating. The country remained on high alert after a wave of attacks commissioned or inspired by Islamic State in Iraq and Syria (ISIS) militants since early 2015. “My thoughts are with the victims of the Strasbourg shooting, which I condemn with the utmost firmness,” tweeted Mr Jean-Claude Juncker, head of the European Commission. European security agencies have feared for some time that Islamist militants who left Europe to fight for ISIS would return after the extremist group’s defeat, with the skills and motivation to carry out attacks at home. In 2016, a truck ploughed into a Bastille Day crowd in Nice, killing more than 80 people, while in November 2015, coordinated Islamist militant attacks on the Bataclan concert hall and other sites in Paris claimed about 130 lives. There have also been attacks in Paris on a policeman on the Champs-Elysees avenue, the offices of satirical weekly Charlie Hebdo and a kosher store. And almost exactly two years ago, a Tunisian Islamist rammed a hijacked truck into a Christmas market in central Berlin, killing 11 people as well as the driver.